3 Green chillies slit vertically into two pieces. 1 teaspoon Biriyani masala (Powder of cloves, cardamom, saunf, bay leaves, cinnamon). 1. 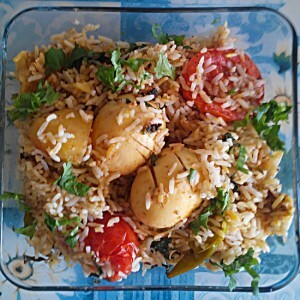 Cook rice along with 2 cloves, 1 cardamom, 1 bay leaves, ¼ tsp Shah Jeera, 1 tablespoon ghee. Let it cool. 2. Boil Eggs. Remove shell and keep aside. 3. In a pan heat oil, add whole garam masala (bay leaves, Cinnamon stick, Cloves, Cardamom, Shah Jeera). 4. Add the sliced onion and slit green chillies. Saute till the onion is translucent. 5. Add ginger garlic paste, sauté few minutes till the raw smell disappears. 6. To the ¾ cup curd, add coriander powder, turmeric powder and red chilli powder. Mix well. Add the mixture to the pan. 7. Add the eggs to the above mixture and cook till the gravy thickens a bit. 8. Add half the pudina and coriander leaves to the gravy. 9. Mix well, take the pan off the stove and keep it aside. 11. Sprinkle biryani masala to the bottom of the pan. 12. Layer with cooked rice. 13. Next add half of the egg masala. 14. Add another layer of rice. 15. Add pudina and coriander leaves. 16. 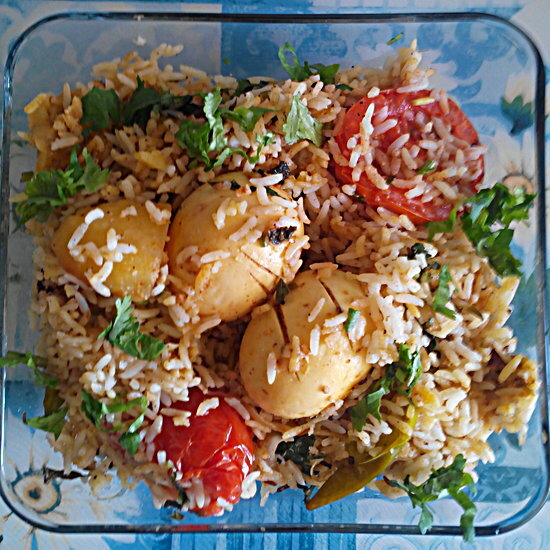 Repeat the layers – biryani masala, rice, egg masala, rice, pudina & coriander leaves. 17. Close the pan with a lid. 18. Cook on slow flame for 15 minutes.